Orange Pigments offered by us absorb Blue Light, which is the complementary color of Orange. These Pigments are used in PVC, Plastic, Paint, Masterbatch, Ink, Coating and Cosmetics. For various types of Textile Printing purposes, our Pigments prove useful. We pack these Pigments using high grade material before offering to the clients. "Color-Trends Industries" is one of the most reputed manufacturer of Organic Pigments. 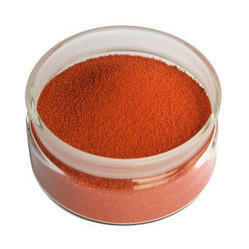 These Pigments are widely use in Paint, Ink, Plastic, Paper, Textile industries. To achieve the cool effect and the other beneficial properties of the TFL Cool System, it is mandatory to use only SELLA cool dyes and the RODA cool pigments, and it is advisable to also use the other products recommended in our recipes, since these products have proven not to jeopardize the result. We have the best quality of Violet Pigments. These pigments are pure and have a wide industrial applications. Namoh Overseas is a professionally managed company with a proven track record, with the main objective of manufacturing and exporting various types of pigments for various application Inks, Paint, Plastics, Rubber, Leather, Textiles. - Coating is a means of enhancing the surface quality of paper and paperboard. The coating process largely levels out the underlying fibrous structures, leaving a more uniform surface that ensures superior printing results. - Alcohols : Iso Propyl Alcohol, N-Butanol, Iso Butanol, N-Propanol, Ethanol etc. - Acetates : Ethyl Acetate, Butyl Acetate, Iso Butyl Acetate, N & Iso Propyl Acetate etc. Our performance range of heavy metal free organic pigments offers exceptional choice to formulate bright solid colors. The Grace product portfolio including SYLOJET SYLOID LUDOX Pigments for high-performance inkjet coatings provides a full range of products which have been used successfully to improve the ink absorption and print quality of glossy and matt coatings. Our transparent and semi-transparent colors are easily combined with Sudarshan’s SumicaTM pearlescent pigments, or with metalic pigments, to produce durable special effect colors for the automotive industry. They are suitable for interior and exterior use.